Today for Inspiration Wednesday I have another card featuring the gorgeous O Holy Night collection from Heartfelt Creations. Cut a piece of white cardstock 10” x 7”, score at 5” along the long side and fold to create a 5” x 7” base card. Cut a piece of gold foil cardstock 5” x 7” and adhere to the front of the card. Die cut the outer frame and the inner decorative frame from the HCD1-7191 Intricate Swirls Frame die in white cardstock. Add the outer frame to the base card and cut a piece of gold cardstock 5 ¼” x 3 1/4“and adhere the white decorative frame, including the centre to the top. Add this to the base card with foam tape. Stamp the Merry Christmas in Versamark ink on white cardstock, heat emboss with gold embossing powder and die cut with the coordinating die. Adhere to the centre of the frame. Stamp 3 pine cone images from the HCPC-3833 Silent Night Scroll Stamp set in Rich Cocoa ink on white cardstock, colour in with Peanut Brittle and Fern Green inks before die cutting with the coordinating die. Shape and add Ultrafine Crystal Glitter to the pine cones with Dries Clear Glue and Frosting Powder to the pine leaves and adhere to the bottom left as shown. Stamp the holly images from the HCPC-3822 Poinsettia & Holly Clusters Stamp set in Library Green ink on iCraft flower shaping cardstock, colour with Leaf Green and Fern Green inks before die cutting with the coordinating dies. Stamp the small and large images from the HCPC-3822 Poinsettia & Holly Clusters Stamp set in Vermillion ink on iCraft flower shaping cardstock, colour with Vermillion ink and die cut with the coordinating die. Shape using the Poinsettia & Holly Clusters mold and assemble when dry. Adhere to the holly leaves and add Crystal Clear glitter to the leaves and flowers and gold Party Balls to the centres before adhering over the pine cones as shown. Stamp the angel images in Versamark ink on white cardstock, emboss with gold embossing powder and die cut with the coordinating dies. Colour the hair with Peanut Brittle ink and the dress with Ultramarine Blue ink and add Crystal Clear to the wings and halo before adhering to the bottom right and nestle among the poinsettias on the left. I am so excited to share the release of the O Holy Night collection from Heartfelt Creations. It is a gorgeous collection featuring traditional colours and designs that is sure to suit everyone. 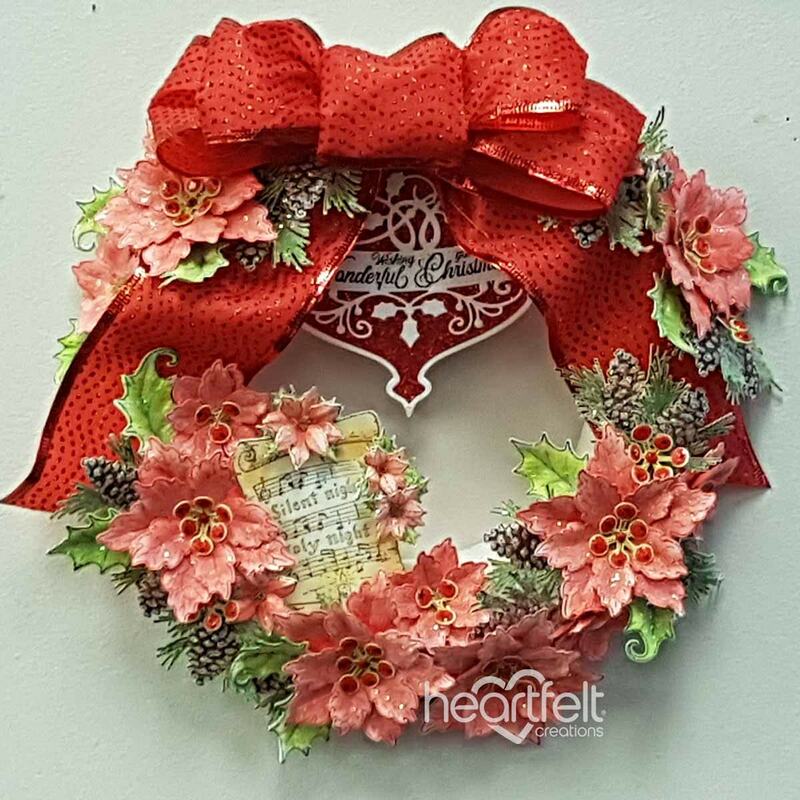 Celebrate and create inspirational Christmas greetings that spread the true meaning of the holiday season with the O Holy Night Collection from Heartfelt Creations! Immerse yourself in the Christmas story right alongside the angels who announced the Savior’s birth, the shepherds who received the good news, as well as the loving family who welcomed the holy babe in Bethlehem so many years ago! Swaddled in a traditional color palette of reds and greens mingled with hues of midnight blues, golden starlight yellows and snowy whites, this festive paper collection has been beautifully wrapped with tender lace like details, charming plaids, flowing swirls, and elegant brocades all nestled among pretty poinsettias, delicate snowflakes, fanciful Christmas ornaments and gentle images depicting that holy night when Christ was born! Three exquisite cling stamp sets along with coordinating dies provide wonderful options for creating dimensional nativity scenes, holiday themed accents such as an old fashioned scroll, a pinecone with greenery, as well as an assortment of beautifully scripted Christmas sentiments in a variety of styles perfect for all of your holiday card making! The substantially sized and intricately detailed ornament die is magnificent for creating wonderful focal point images on card fronts, stunning accents on scrapbook layouts, or for creating ornament shaped cards ready to deliver your Christmas greetings to friends and loved ones! So pause, reflect and spread the message of God’s love given that holy night so many thousands of years ago as you create and send off holiday wishes with the O Holy Night Collection. I have two projects to share – the first one is a wreath that I have made with poinsettias, pine cones and ribbons. This would make a perfect door hanging at Christmas time. Instructions: Click here to view a larger photo of this project. Paint the polystyrene circle frame with the heavy white gesso and add Frosting Powder to the wet paint. Allow to dry. Die cut the ornament from red glitter paper and white cardstock. Stamp the sentiment from the HCPC-3834 Noel Sentiments Stamp set in Tuxedo Black on the die cut decorative die and adhere to the top of the red glitter die cut. Add to the top of the frame with a hot glue gun. Create the ribbon bow and adhere to the frame with a hot glue gun and wire for extra stability. Stamp the scroll image from the HCPC-3833 Silent Night Scroll Stamp set in Tuxedo Black ink on white cardstock and die cut with the coordinating dies. Colour the scroll with Peanut Brittle, Fern Green and Vermillion inks, shape lightly with your fingers and adhere to the bottom left as shown. Stamp the holly images from the HCPC-3822 Poinsettia & Holly Clusters Stamp set in Library Green ink on iCraft flower shaping cardstock, colour with Leaf Green and Fern Green inks before die cutting with the coordinating dies. Stamp the small and large images from the HCPC-3822 Poinsettia & Holly Clusters Stamp set in Vermillion ink on iCraft flower shaping cardstock, colour with Vermillion ink and die cut with the coordinating die. Shape using the Poinsettia & Holly Clusters mold and assemble when dry, adhere to the holly leaves and add Crystal Clear glitter to the leaves and flowers and gold Party Balls to the centres before adhering over the scroll as shown. Stamp the pine cone images from the HCPC-3833 Silent Night Scroll Stamp set in Dark Brown on the flower shaping cardstock, colour in with Sepia, Library Green and Fern Green inks before die cutting with the coordinating die. Shape and add Ultrafine Crystal Glitter to the pine cones with Dries Clear Glue and adhere around the frame as shown. Stamp the poinsettia images from the HCPC-3680 Sparkling Poinsettia Stamp set in Vermillion ink on flower shaping cardstock, colour with Vermillion ink and die cut with the coordinating die. Shape the flowers using the groove golf tool set and when dry assemble as shown. Add gold party balls to the centre of the flowers. Colour the stamens with Veridian ink and add Red Holly Nuvo drops to the centres and add a touch of Black Nuvo drops to the red drops. Allow to set and add to the centre of the flowers and around the wreath as shown. Stamp the leaves from the HCPC-3679 Large Sparkling Poinsettia Stamp set in Library Green ink on flower shaping cardstock, colour in with Leaf Green and Fern Green inks and die cut with the coordinating die. Shape using the groove golf tool set and add Crystal Clear glitter and add around the flowers as shown. My second project is a card that I have made using one of the new decorative dies. I am finding they are my go to dies for making elegant cards for all occasions. Instructions: Cut a piece of white cardstock 10″ x 7″, score at 5″ along the long side and fold to create a 5″ x 7″ base card. Using a stamp positioner, stamp the sentiment image from the HCPC-3834 Noel Sentiments Stamp set in Tuxedo Black ink in the centre of the card. Die cut two decorative dies from the Eyelet Lace Frames Die set in white cardstock and adhere them together. Adhere to the base card with foam tape. Stamp the images from the HCPC-3832 O Holy Night Stamp set in Jet Black ink on Bristol Smooth cardstock and die cut with the coordinating image. Colour the image with Zig Clean Colour Brush Markers and adhere to the bottom left as shown. Stamp 3 pine cone images from the HCPC-3833 Silent Night Scroll Stamp set in Rich Cocoa ink on white cardstock, colour in with Peanut Brittle and Fern Green inks before die cutting with the coordinating die. Shape and add Ultrafine Crystal Glitter to the pine cones with Dries Clear Glue and adhere to the top right card as shown. To finish, add clear sparkles to the decorative die. Today I have a layered album to show you featuring the very sweet Sweet as Honey Collection from Heartfelt Creations. This collection lends itself beautifully to a layered album with a story to tell. Cut 9 pieces of patterned paper 5 ¾” x 5 ¾” and die cut the circles in the centres using the HCD1-7155 Circle Basics – Large dies. Assemble the layers on the card and then adhere the papers to the card. Die cut the trim using the eyelet edge from the 7156 Eyelet Ovals & Basic – Small and the largest plain die from the HCD1-7155 Circle Basics – Large die set from yellow cardstock and adhere to the front of the album. Stamp several coneflower images from the HCPC-3828 Garden’s Edge Coneflower Stamp set and the HCPC-3830 Honey Bee Bungalow stamp set in Fern Green, Orange Monarch and Sepia inks on white cardstock. Colour the stem and leaves in Leaf Green ink, the flowers with Buttercup inks, and the head with Peanut Brittle inks and die cut with the coordinating die. Shape the flowers and add Espress-O Yourself Prills to the heads. Add Crystal Clear to the flowers, trim and and adhere to the bottom right and left of the front of the album. Stamp the heart leaf image from the HCPC-3811 Rainboots and Blossoms stamp set in Tuxedo Black ink on white cardstock and colour in with Forget Me Knot and Fern Green inks before die cutting with the coordinating die. Shape lightly and add to the bottom of the card around the cone flowers as shown. Stamp the bee maiden image from the HCPC-3829 Honey Bee Maidens stamp set in Jet Black ink on Bristol Smooth paper and die cut with the coordinating die. Colour the image in with the Zig Clean Colour Brush Markers and add Crystal Clear glitter to the wings with Dries Clear glue on a damp sponge. Add Ultrafine Crystal glitter to the skirt with Dries Clear glue on a damp sponge and adhere to the top left above the sunflowers. Stamp the bees from the HCPC-3831 Sweet as Honey stamp set in Jet Black ink on Bristol Smooth cardstock and colour in with Zig Clean Colour Brush Markers and die cut with the coordinating die. Add Crystal Clear glitter to the wings before attaching the bees to the flowers as shown. Die cut the sentiment from the paper collection using the tag die from the HCD1-745 Luggage & Tags die set and adhere to the bottom of the album as shown. Stamp the bungalow image from the HCPC-3830 Honey Bee Bungalow stamp in Jet Black ink on Bristol Smooth cardstock and colour in with Zig Clean Colour Brush markers and die cut with the coordinating die. Adhere to the left of the circle. Stamp the honey pots and the honey stirrer from the HCPC-3830 Honey Bee Bungalow stamp in Jet Black ink on Bristol Smooth cardstock and colour in with Zig Clean Colour Brush markers and die cut with the coordinating die. Add Ultrafine Crystal glitter to the pots and adhere to the bottom right of the page. Stamp several coneflower images from the HCPC-3828 Garden’s Edge Coneflower Stamp set and the HCPC-3827 Backyard Blossoms Stamp set in Fern Green, Orange Monarch and Sepia inks on white cardstock. Colour the stem and leaves in Leaf Green ink, the flowers with Buttercup inks, and the head with Peanut Brittle inks and die cut with the coordinating die. Shape the flowers and add Espress-O Yourself Prills to the heads. Add Crystal Clear to the flowers, trim and adhere to the bottom right and left of the front of the album. Stamp the bungalow image from the HCPC-3830 Honey Bee Bungalow stamp set in Jet Black ink on Bristol Smooth cardstock. Colour in with Zig Clean Colour Brush markers and die cut with the coordinating die. Adhere to the bottom left. Stamp the bungalow image from the HCPC-3830 Honey Bee Bungalow stamp set in Jet Black ink on Bristol Smooth cardstock. Colour in with Zig Clean Colour Brush markers and die cut with the coordinating die. Add to the circle on the right as shown. Stamp the path image from the HCPC3772 – Wildwood Cottage Accents stamp in Jet Black ink on Bristol Smooth cardstock. Colour in with Zig Clean Colour Brush markers and adhere below the bungalow around the bottom of the circle. Stamp several coneflower images from the HCPC-3828 Garden’s Edge Coneflower Stamp set and the HCPC-3827 Backyard Blossoms Stamp set in Fern Green, Orange Monarch and Sepia inks on white cardstock. Colour the stem and leaves in Leaf Green ink, the flowers with Buttercup inks, and the head with Peanut Brittle inks and die cut with the coordinating die. Shape the flowers and add Espress-O Yourself Prills to the heads. Add Crystal Clear to the flowers, trim and and adhere to the bottom right and left of the path. Stamp the wheat image from the HCPC-3827 Backyard Blossoms Stamp in Fern Green and Peanut Brittle inks on white cardstock. Colour the stems with Leaf Green ink and the tips with Peanut Brittle inks and die cut with the coordinating die. Add Heart of Gold Prills to the tips and adhere to the bottom left. Stamp several coneflower images from the HCPC-3828 Garden’s Edge Coneflower Stamp set and the HCPC-3827 Backyard Blossoms Stamp set in Fern Green, Orange Monarch and Sepia inks on white cardstock. Colour the stem and leaves in Leaf Green ink, the flowers with Buttercup inks, and the head with Peanut Brittle inks and die cut with the coordinating die. Shape the flowers and add Espress-O Yourself Prills to the heads. Add Crystal Clear to the flowers, trim and and adhere to the bottom right and left of the front of the album. Trim the sentiment from the paper collection and adhere to the bottom right as shown. Die cut the eyelet oval from the 7156 Eyelet Ovals & Basic – Small die set in the yellow cardstock and adhere to the middle of the page. Then cut another circle using the largest die from the large circle die set in yellow cardstock and adhere to the eyelet circle. Die cut the patterned paper using the second largest circle die from the large circle die set and adhere to the previously cut circles. Die cut the tags from the paper collection using the HCD1-745 Luggage & Tags die set and adhere to the spine with hemp twine. Add a strip of paper 5 ¾” x ½” over the spine. Then finish with a 5 ¾” zip strip featuring the bees. To finish the album, add Ultrafine Crystal glitter to all the pages using Dries Clear glue.